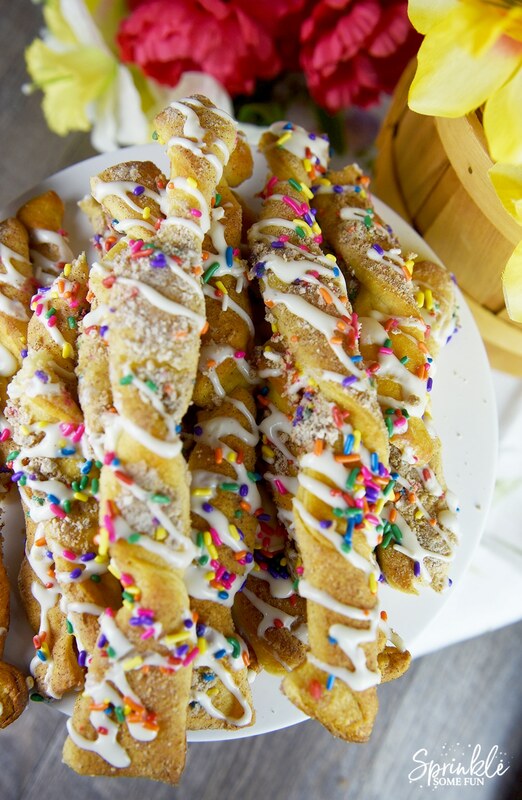 This Cake Batter Cinnamon Twists is a sponsored post. All opinions are my own. My daughters love cooking and baking now that they are a bit older. The other day my daughter was begging me to let her make something sweet and so I told her she had to use whatever we already had. 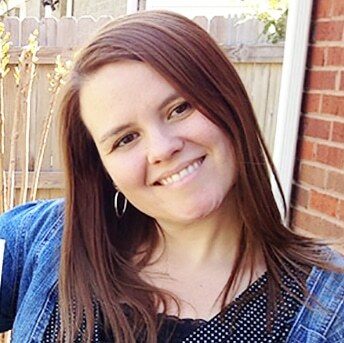 I knew we had a roll of Pillsbury Crescent Roll Dough in our refrigerator and a cake mix in the pantry. Then I thought to combine the two into a fun springtime treat! 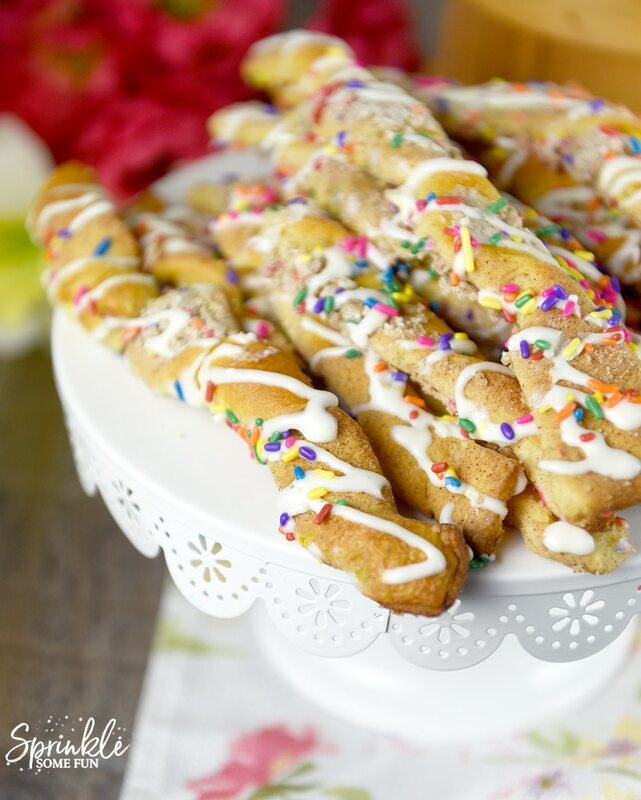 These Cake Batter Cinnamon Twists are super easy to make and are perfect for any springtime occasion. We will be making these again soon for Easter! Pillsbury Crescent Roll Dough is pretty much the most versatile item I have in my refrigerator. You can make them into cinnamon rolls, pizza crusts, crescent rings and the list goes on! I always pick up a few of them any time we go to Walmart! 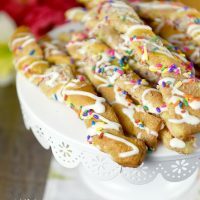 We like to twist them up and sprinkle cinnamon and sugar on them for cinnamon twists and this time adding the cake batter was amazing! I loved the buttery, sweet and cinnamon taste these had. 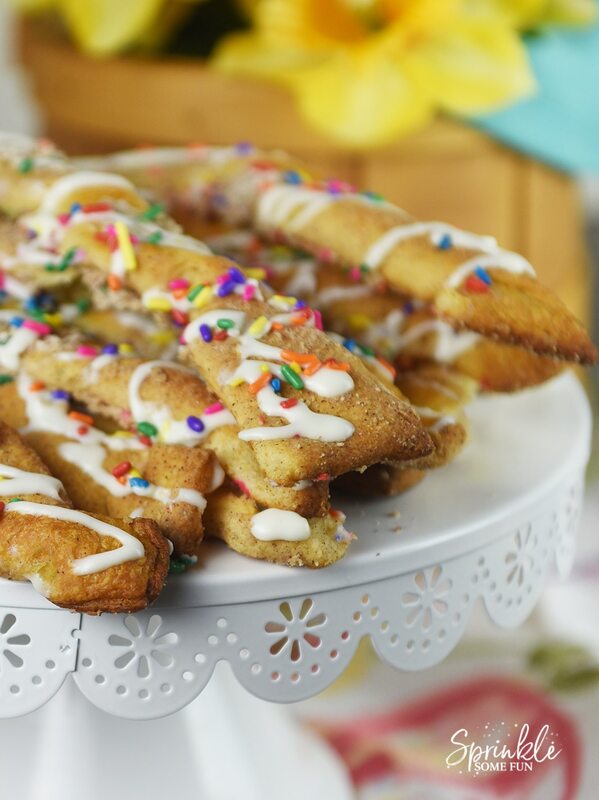 Then I topped these Cake Batter Cinnamon Twists with cream cheese icing. So heavenly! They certainly didn’t last very long at all! Preheat oven to 375. Roll dough out on a baking sheet and pinch together any seams. Meanwhile mix together butter, cinnamon, cake mix and 1 tbsp. sprinkles together in a small bowl. Spread the mix on the dough evenly. Cut the dough into long strips. Twist each strip and bake on 375 for around 9 minutes. In another bowl mix the cream cheese, milk and powdered sugar together. Add the mixture to a piping bag and cut the end to make a small opening. Drizzle the cream cheese mixture onto the cinnamon twist with the piping bag. 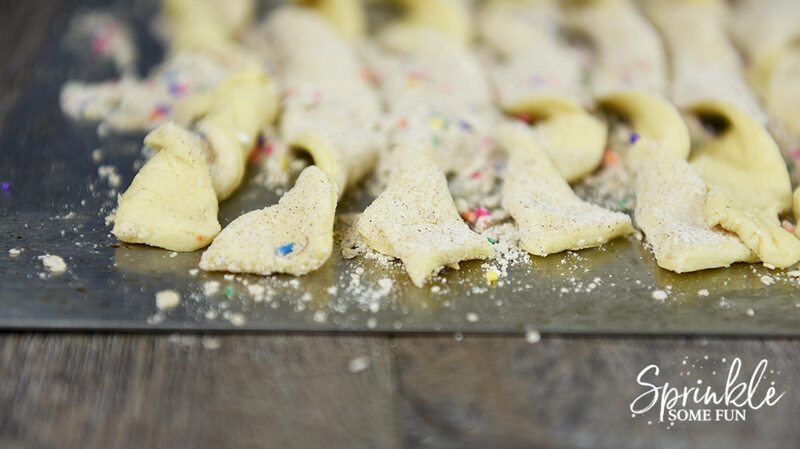 Add the rest of the sprinkles. Serve and Enjoy! 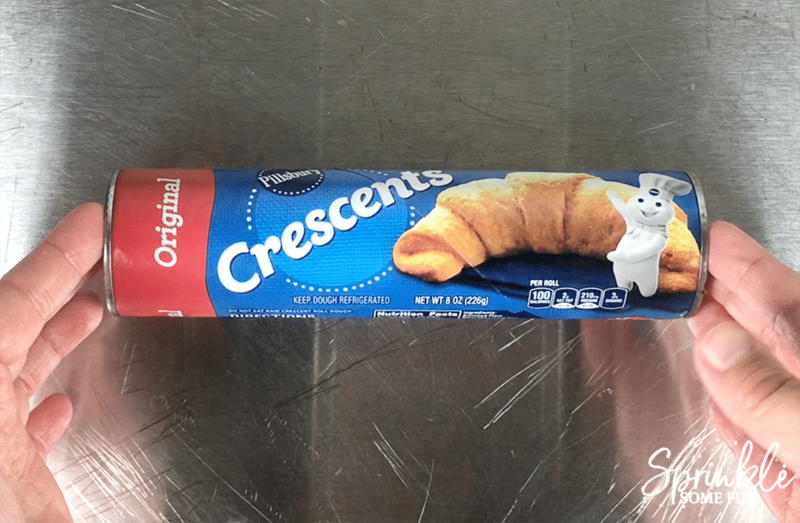 What do you like to make with Pillsbury Crescent Rolls?